What's your pleasure? A sparkling pool? A babbling brook? A tumbling waterfall? 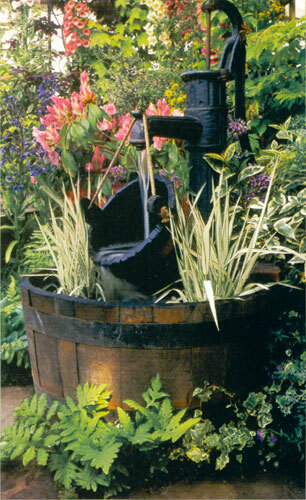 For many, the makings of a water garden require little more than a pump, some water and an idea. For others, however â€“ those with visions of water lilies and perhaps a goldfish or two â€“ a little more effort is required. This requires creating your very own ecosystem. An environment so rich in life, that it will likely become the most beautiful and alluring aspect of your garden â€“ and quite possibly, the most rewarding.Â Nothing quite complements a summerâ€™s afternoon in the garden more than listening to the relaxing sound of a rippling waterfall, watching the sun sparkle on the water. At night, sit back and watch the glow of your pond light transform your water feature into a moving curtain of colour. Before you jump into water gardening with both feet learn as much as you can.Â There is all the fun of planning and design in the early stages.Â Study your yard. Watch how the sunlight travels across it and how the rain and groundwater flows over the land. Then decide what kind of water garden you wish to create â€“ its purpose and style, whether it may have a formal or informal theme, preformed or create your own design with a flexible liner.Â There is also a huge range of options available when considering water features, with a choice of fountains, waterfalls and water spitters.Â If space is a problem, it can be overcome with simple yet effective patio ponds or water wall. Finally, draw up a plan. Engage in this kind of thought, reflection and patience and you'll be rewarded with more than a simple water garden, you'll have a true sanctuary.Â Your options are endless. Water Plan Irrigation stocks an extensive range of pond equipment.Â They can supply you with everything youâ€™ll need for a magnificent water feature and/or pond.Â From liners, natural-look pre-formed ponds, formal ponds, pumps, fountains, waterfalls, lighting, ornaments, rocks, oxygenates, filtration, ultra violet clarifiers, streams, chemical treatments for bacteria, algae, plants and fish and water test kits. We also have a selection of books full of colourful pictures to inspire even the most conservative gardener.